I knew I’d be in for some ribbing when I said yes to doing an article and video for Fine Homebuilding’s Master Carpenter series. 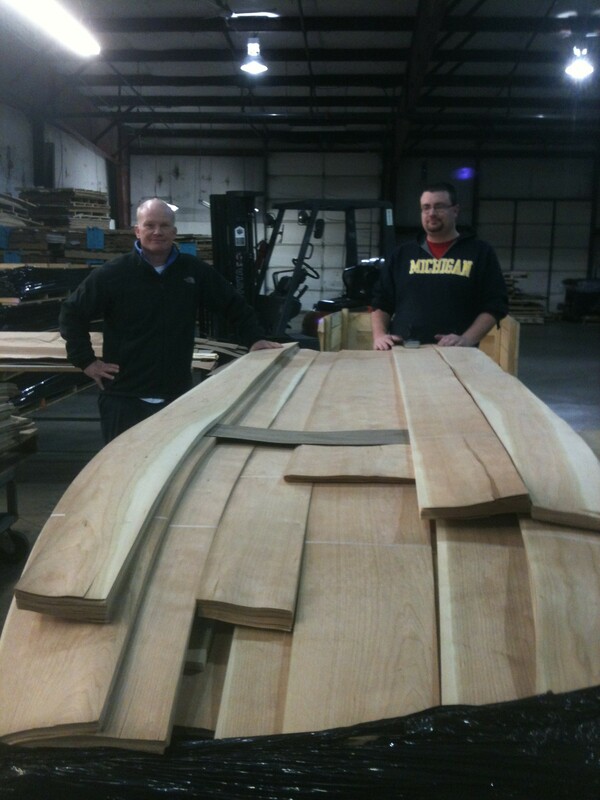 No, I am not a carpenter, let alone a master carpenter; I don’t know how to frame a house, build a roof, or engineer a staircase, and I have the highest respect for those who do, such as Mark Longacre and Chris Sturbaum, two contractors with whom I work on a regular basis. Furthermore, I groan every time I hear someone call him- or herself a “master”-anything. As an augmenter of titles, “master” tends to be more of a marketing claim than an indicator of substance. Most of the professionals I know who have actually mastered their craft do not call themselves master craftspersons. But the series is called Master Carpenter. I’m not responsible for the name. 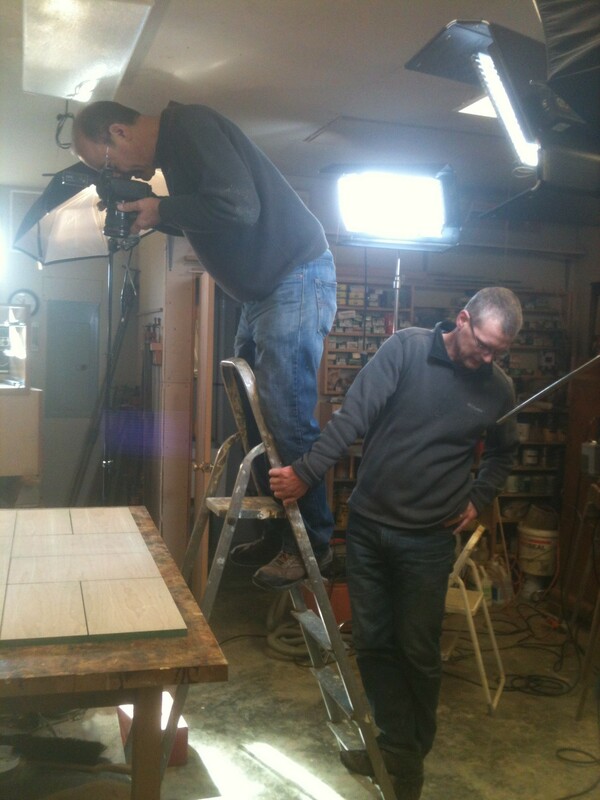 Senior Editor Chuck Bickford photographs the drawer faces and doors while videographer John Ross steadies the ladder. 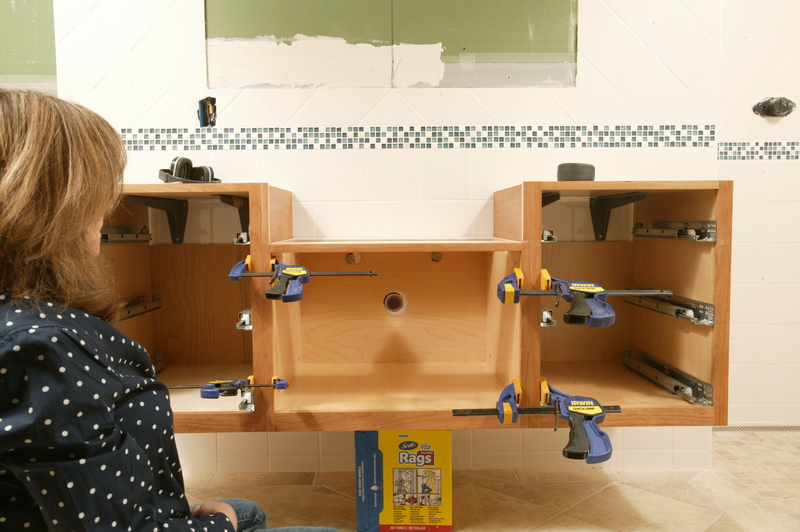 Engineering the vanity was more challenging than its simple appearance may suggest. The architect who designed the piece specified that it hang from the rear wall and be made with a removable center section, allowing the ensemble to be easily converted for wheelchair access. 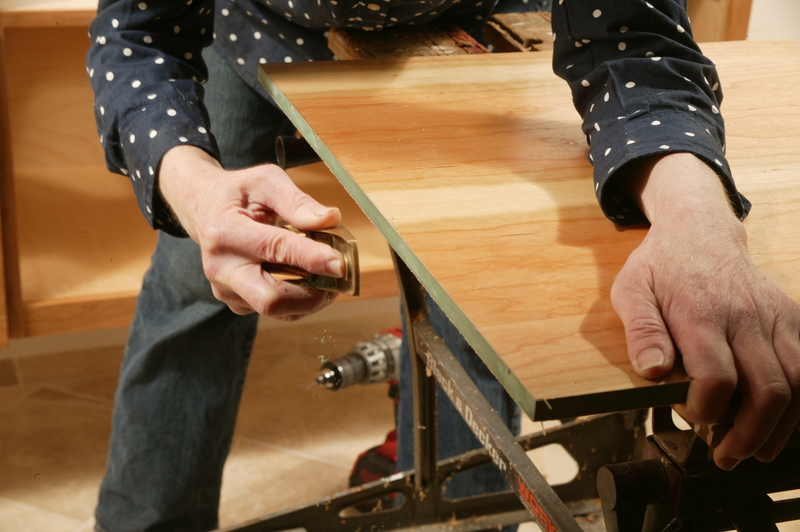 While upper cabinets in kitchens are routinely hung from back walls, they tend to be shallow–usually just 12 inches. When a kitchen has deeper upper cabinets, those are typically attached to adjacent casework or a side wall for extra support. Many floating cabinets are installed in alcoves, where walls on both sides allow the entire depth (that is, front to back) to be supported. But in this case, the weight of the 21-inch deep cabinet and its concrete counter would need to be supported solely from the back wall. Whether I used a cleat or heavy-duty brackets, there would be considerable stress on the joints between the tops and sides of the cases. To minimize this stress I decided to take at least some of the load off the top corner joints by adding hidden support beneath the cabinet sides. This additional support would also counteract shear. If the center section was ever removed, the sides of the drawer sections would be exposed, so they, along with the ends, would have to be finished. Having the center section removable also called for a neater-looking means of attaching the cases to each other than my usual twinthread cabinet screws run through the face frames, which would leave ragged holes if the center case were taken away. A third, though not the final, challenge was presented by the need to crate the cabinets and ship them via UPS to Newtown, Connecticut, where they would be installed in Taunton’s Project House. These cabinets were large and heavy, but UPS, the shipper of choice in this case, has limits to the dimensions and weight of packages it will accept. Having calculated the weight of the cabinets while figuring out which support brackets I would use to hold them on the wall (that calculation had to take into account the plywood, the drawer boxes, the drawer slide hardware, and the MDF doors, drawer faces, and end panels, in addition to the concrete counter), I now had to factor in the considerable weight of those support brackets themselves, plus the angle iron, and the OSB* from which I would build the crates. 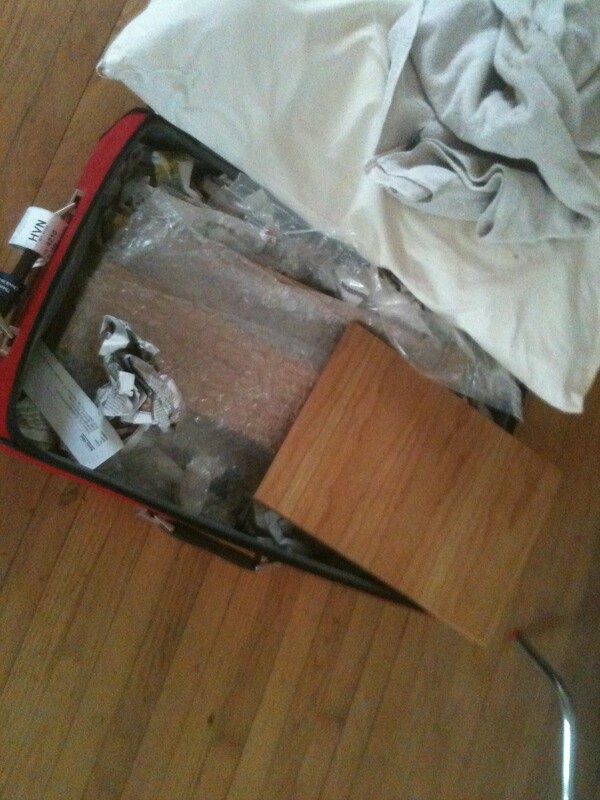 In the end, it was clear that I would have to carry some of the parts with me in luggage–the cabinet parts in my suitcase and the brackets in my laptop case. 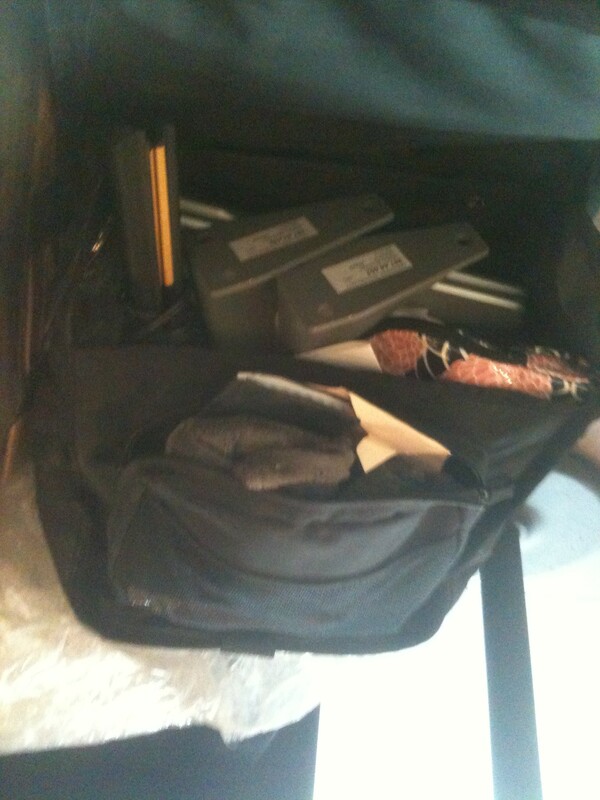 Laptop, hair iron, toiletries, and Hebgo brackets from Hafele. The cabinet’s most glorious feature is the face veneer, custom-pressed onto a water-resistant MDF** substrate by Heitink Veneers. I chose this particular veneer, which is characterized by robust grain with sapwood and the occasional resin pocket, to celebrate the life of the tree. 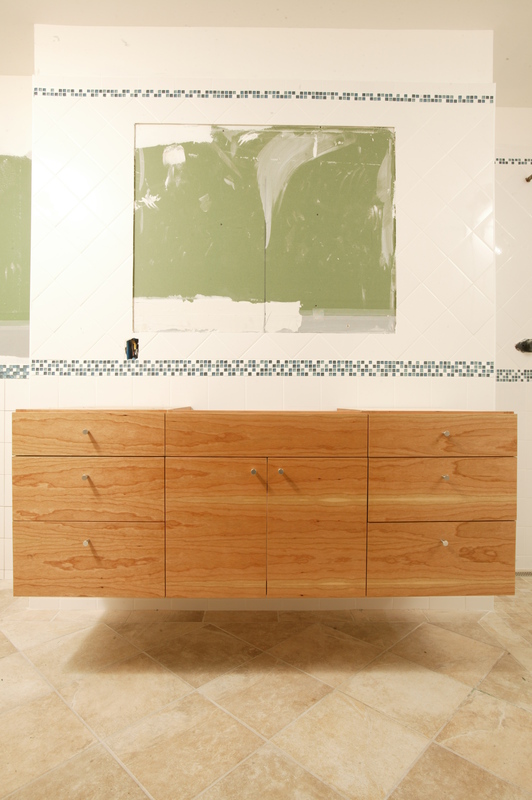 In my view, this style of cabinetry is about nothing if not the beauty of wood. 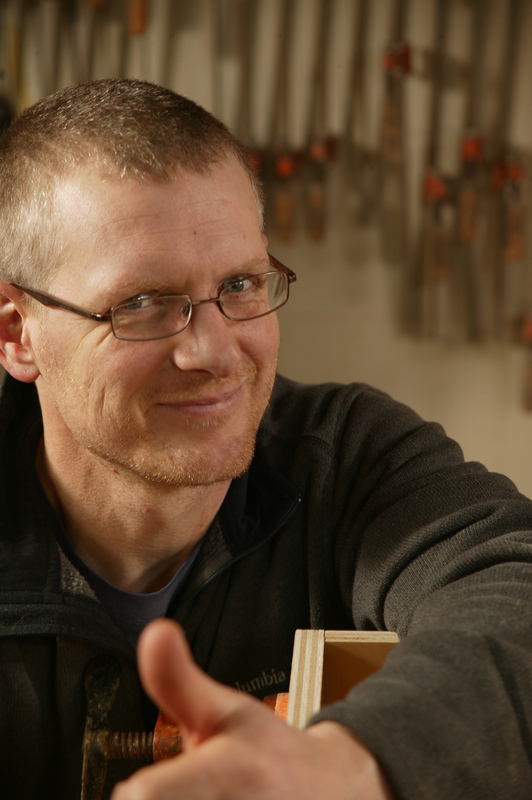 Ryan Lane and Jarred Black of Heitink Veneers present a cart laden with a mouthwatering selection of cherry, from rustic and knotty to foot-wide pieces of clear heartwood, densely curled. The Project House in Newtown really is a project. 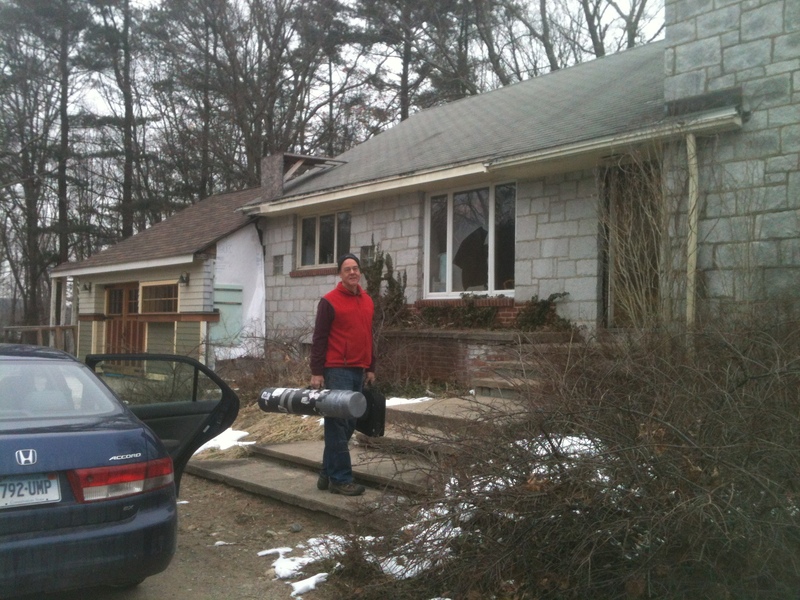 Chuck carries photography and video equipment to the front door. A quick tour of the place will take Homebuilding readers back to features on wiring, insulation, drywall, hanging doors, and building a charming garage. In each case, camera angles, lighting, and cropping have been expertly employed to conceal the larger milieu: an empty house with granite veneer siding. The house happened to be on Taunton-owned property, and it has proved ideal as a stage for article and video projects. 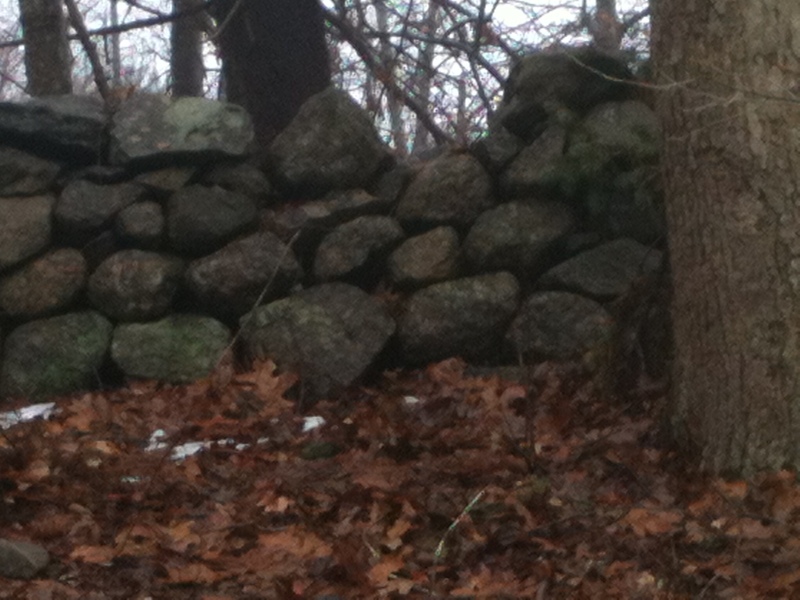 For me, one of the most impressive features of the place was the dry-laid granite wall outside. Fitting an MDF end panel with a Lie-Nielsen plane struck me as heretical, but that was the only tool available for the purpose, Photo by Charles Bickford, courtesy of Taunton Press. 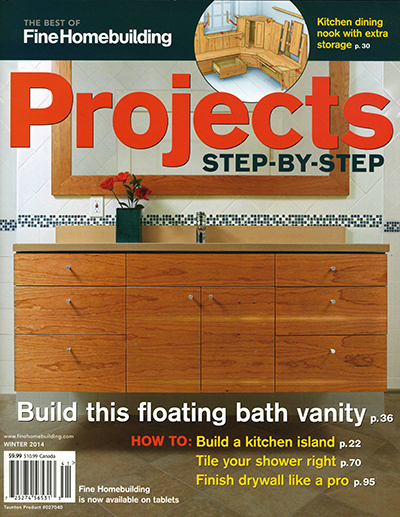 The vanity project appeared in Fine Homebuilding #236 (June-July 2013), then made the cover of Fine Homebuilding’s 2014 special-interest “Projects” publication. Videographer John Ross gives the thumbs up. Photo by Charles Bickford, courtesy of Taunton Press.